Base treatment on numbers of healthy larvae present. 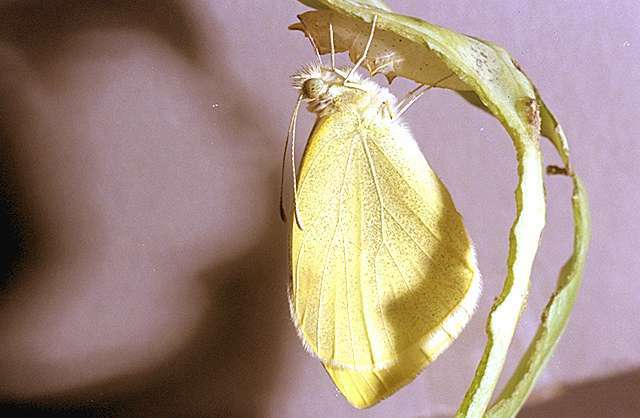 Treat seedlings or small plants if populations of medium-sized to large caterpillars are high enough to stunt growth. Treatment prior to harvest is necessary to prevent contamination for harvested product. 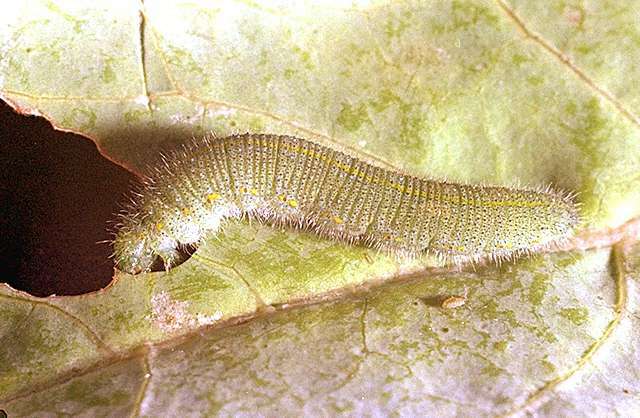 Natural enemies can assist significantly in the control of imported cabbageworm. Important parasites include the pupal, larval, and egg parasites in the Trichogramma genus, as well as tachinid flies. Timely mass releases of commercially available trichogramma during peak flight can be an effective control agent. Viruses and bacterial diseases are also sometimes important control factors in the field. Where possible, use Bacillus thuringiensis (Bt) to avoid adverse impact on natural enemies. Bt is very effective against imported cabbageworm, especially when applied to young (early-instar) caterpillars. beta-cyfluthrin (Baythroid XL) at 0.013 to 0.019 lb ai/a. PHI 0 days. REI 12 hr. Retreatment interval 7 days. Do not exceed 0.1 lb ai/a per season. bifenthrin/imidacloprid (Brigadier) at 0.06 to 0.095 lb ai/a. PHI 7 days. REI 12 hr. Do not exceed 0.24 lb ai/a imidacloprid and 0.24 lb ai/a bifenthrin. Retreatment interval 7 days. Maximum 5 treatments only after bloom. carbaryl (Sevin 4F) at 1 to 2 lb ai/a. PHI 14 days. REI 12 hr. Limit 4 treatments per year. Do not exceed 6 lb ai/a per crop. Retreatment interval 7 days. chlorantraniliprole (Coragen) at 0.045 to 0.098 lb ai/a as soil, chemigation or foliar treatment. PHI 3 days. REI 4 hr. Limit 4 treatments per crop. Retreatment interval 3 days foliar, 10 days drip chemigation. Do not exceed 0.2 lb ai/a per season. cryolite (Kryocide) at 7.7 to 15.4 lb ai/a. PHI 14 days. REI 12 hr. Do not exceed 92 lb ai/a per season. Some formulations are OMRI-listed for organic use. Collards only. cyantraniliprole (Exirel) at 0.045 to 0.88 lb ai/a. PHI 1 day. REI 12 hr. Retreatment interval 5 days. Do not exceed 0.4 lb ai/a per year. Limit 6 treatments per year. cyfluthrin (Tombstone) at 0.025 to 0.038 lb ai/a. PHI 0 days. REI 12 hr. Retreatment interval 7 days. Do not exceed 0.2 lb ai/a per season. cypermethrin (Holster) at 0.05 to 0.1 lb ai/a. PHI 1 day. REI 12 hr. Retreatment interval 7 days. Do not exceed 0.4 lb ai/a per year. emamectin benzoate (Proclaim) at 0.0075 to 0.015 lb ai/a. PHI 14 days. REI 12 hr. Do not exceed 0.09 lb ai/a per season. Retreatment interval 7 days. Do not graze. esfenvalerate (Asana XL) at 0.03 to 0.05 lb ai/a. PHI 7 days. REI 12 hr. Do not feed crop residue. Do not exceed 0.2 lb ai/a per year. Collards only. indoxacarb (Avaunt) at 0.045 to 0.065 lb ai/a. PHI 3 days. REI 12 hr. Do not exceed 0.26 lb ai/a per crop. Limit 4 treatments per year. Retreatment interval 3 days. malathion (Malathion 8) at 1.0 lb ai/a. PHI 7 days. REI 12 hr. Retreatment interval kale 5 days, collards 7 days. Limit 3 applications. methomyl (Lannate SP) at 0.45 to 0.9 lb ai/a. PHI 10 days. REI 48 hr. Do not exceed 5.4 lb ai/a collards per year. Fresh market Collards only. methoxyfenozide (Intrepid 2F) at 0.06 to 0.12 lb ai/a for early-season application or at 0.12 to 0.16 lb ai/a for mid- to late-season application. PHI 1 day. REI 4 hr. Do not exceed 1 lb ai/a per season. spinosad (Success, Entrust SC) at 0.047 to 0.094 lb ai/a. PHI 1 day. REI 4 hr. Do not exceed six applications or 0.45 lb ai/a per crop. Entrust SC is OMRI-listed for organic use. tebufenozide (Confirm 2F) at 0.09 to 0.12 lb ai/a early-year; 0.12 lb ai/a mid- to late-year. PHI 7 days. REI 4 hr. Do not exceed 0.12 lb ai/a per application or 0.625 lb ai/a per year. Retreatment interval 10 days. Use of a surfactant is recommended. thiamethoxam/chlorantraniliprole (Durivo) at 0.195 to 0.257 lb ai/a applied to the soil. PHI 30 days. REI 12 hr. Do not 0.172 lb ai of thiamethoxam or 0.2 lb ai of chlorantraniliprole per acre per growing season.